Deck 13 (Venetica, Lords of the Fallen) & publisher Focus Interactive, have unveiled some scarce details regarding the developer’s next project – The Surge. The Surge, set in the not-so-distant future, sees you playing as a humble engineer within an international mega-corporation dedicated to fixing the Earth’s declining atmosphere via climate control methods. It all goes rapidly wrong however, and subsequently – and this is where the story gets a bit vague – equipped with his heavily armoured mechanical exoskeleton the protagonist finds himself having to carve his way through masses of mechs and gigantic bosses. The game features quite novel upgrade & combat mechanics, with some enemies having clear weak-points which allow for effective take-downs if targeted – however, once a mech suit is down it’s parts fail with it, meaning the people who smash through tougher armour will be rewarded with loot, and usable salvage for their endeavours. These pieces are then used to augment the protagonist’s mech because, you know, recycling is good for the environment too. In addition to the above there’s also a dismemberment system in game, as well as a weapon system revolving around improvised weapons, and also craft-able weapons once blueprints have been located. Deck 13 have shown that they can manage twists on conventional ARPG mechanics with Lords of the Fallen, and it’s also very hard to say no to a game with mechs in it. At the moment the game has a preliminary launch date of 2017, and is listed for PC, PS4 & Xbox One releases. More information on the story, and hopefully a look at some gameplay, is set to emerge over the coming months. 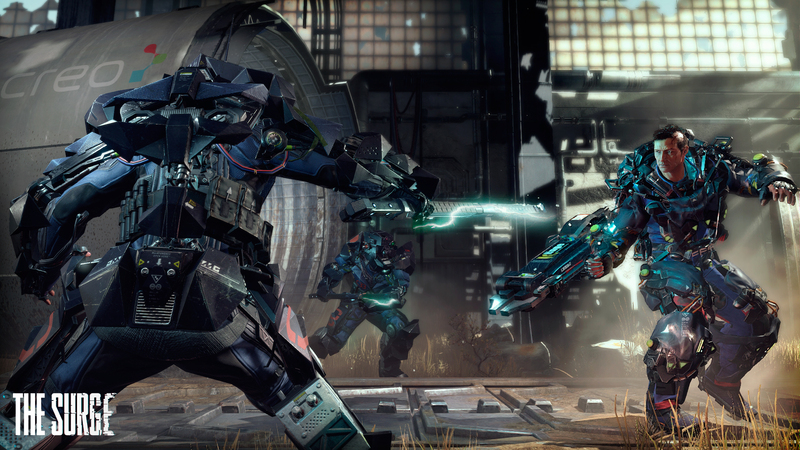 The Surge is the new sci-fi Action RPG from developer Deck 13, set in the near-future. Play as a CREO factory employee Warren, equipped with a highly advanced mechanical exoskeleton designed to assist in heavy industrial labour. Start your journey as a new CREO applicant, in a massive international company dedicated to repairing the atmosphere and addressing climate control. Soon, danger rears its ugly head, and you will have to upgrade your exoskeleton to fight and survive. 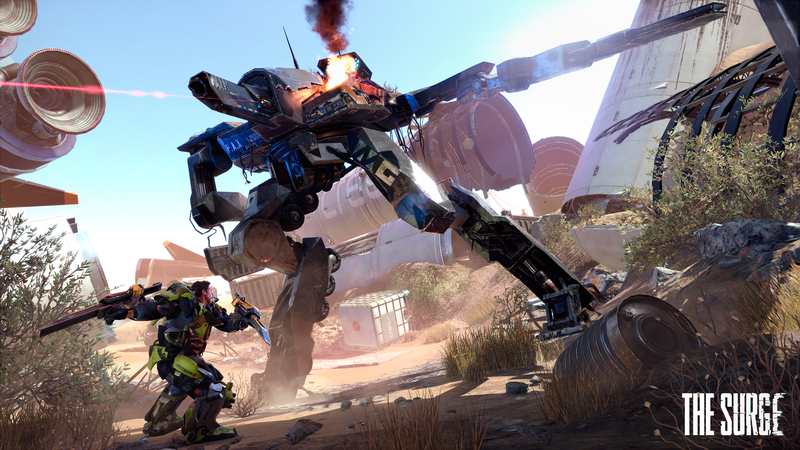 The Surge’s combat system is fast-paced, tactical, and brutal, with an innovative limb targeting system enabling you to attack and cut off specific limbs, farming materials to craft upgrades for your exo-suit. Some enemies will have less armour on their legs or their arms, making for an easy kill, but poor loot! You have to decide if you want to go for the easy kill, or instead opt for modules and crafting materials that will give you a combative edge. The screenshots revealed today show off some of the security forces you’ll be facing in your adventure. They use the same exo-suit technology as you but have tools built for combat, making them incredibly deadly foes. In The Surge, you will not just be facing opponents your own size; towering mechanical enemies armed to the teeth are ready to face against you. Become man and machine when The Surge releases in 2017 on PlayStation 4, Xbox One, and PC. With more than ten years of experience, Frankfurt-based Deck13 Interactive is one of Germany’s most renowned game developers. Their humorous adventure games received several awards, including “Best German Game of the year” for Ankh and “Best adventure game of the year” for Jack Keane. With the release of Deck13’s role-playing game Venetica, Deck13 entered the world of emotionally challenging games for PC, Xbox360 and Playstation3. Having completed the stunning RPG Lords of the Fallen, at the same time, creating unique projects for mobile platforms like iOS, we are starting work on an entirely new RPG.